Published on December 1, 2017 in general info. 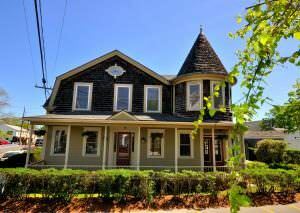 Closed Tags: Cape Cod Luxury condo sales, Cape Cod Luxury homes, Cape Cod new construction, Cape Cod real estate, Cape Cod sales, Provincetown luxury homes, Provincetown new construction, Provincetown real estate. MLS REMARKS: Classic single family with charming details & sweeping front porch in the heart of town. 1st floor features a large living room, dining room, & den/media room with half bath. A sun room offers true indoor/outdoor living. The eat-in kitchen boasts extensive cabinetry, updated appliances, brick fireplace, & rear deck access. Upstairs, two master suites feature charming architectural details & ensuite baths, plus a large third bedroom & hall bath. Highlights include AC throughout, new propane furnace, whole house water filter system, indoor/outdoor sound system, & basement/attic storage. The large lot features beautiful gardens, expansive entertaining deck, storage shed, & parking for six+ cars, all located just a block from Commercial St. This one of a kind home features open concept living and generous outdoor spaces, while still retaining many of its original exterior architectural features.